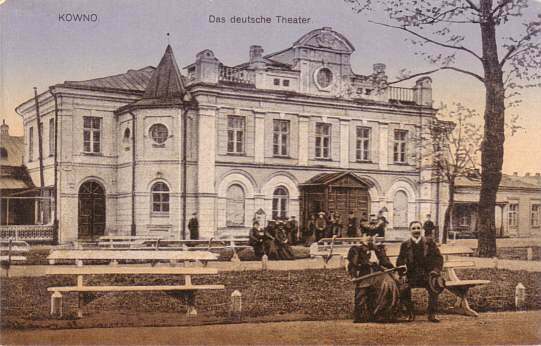 Built 1891-1892 as municipal theatre by Ustinas Golinevicius for the city of Kaunas. Opened 9 Jan 1892. Also known as "Deutsches Theater" [German Theatre]. 1916 stage extension. 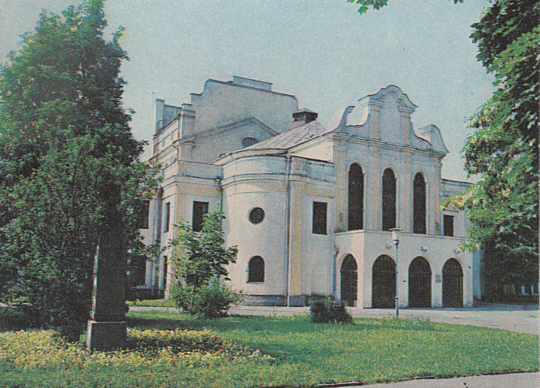 Home to the first professional drama (1920), opera (1920), and ballet (1925) companies in Lithuania. 1925 exterior and interior rebuilding by Mykolas Songaila and Vladimiras Dubeneckis with P. Morkunas. 1925 renamed "Kauno Valstybinis Teatras" [Kaunas State Theatre]. 1930-1933 exterior and interior rebuilding and extensions by V. Landsbergis-Zemkalnis. 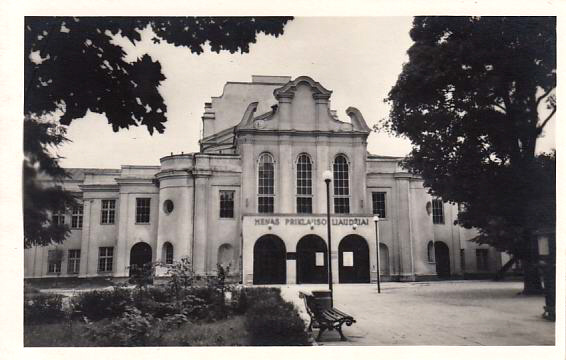 1948 renamed "Kauno Valstybinis Muzikinis Teatras" [Kaunas State Musical Theatre]. 19801-984 exterior and interior rebuilding and extension by underground dressing rooms and an underground rehearsal hall by K. Zalnerius and A. Staskevicius. Originally 500 seats, after 1925: 763 seats. 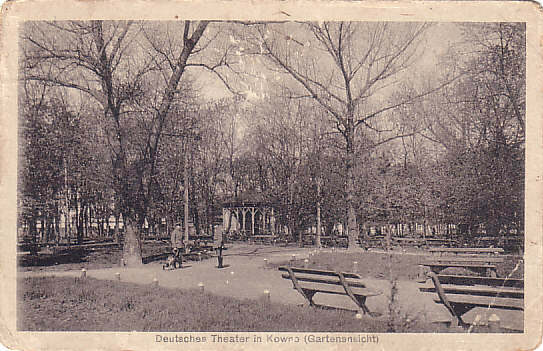 Reverse Text: "Kowno, Deutsches Theater"
Reverse Text: "Kaunas, Valstybnis Dramos Teatras; Kaunas, Gosudarstvenny Dramatichesky Teatr"
Reverse Text: "Kauno muzikinis teatras - Kaunassky muzykalny teatr - Kaunas. Musical Theatre - Kaunas. Das Musiktheater"
Reverse Text: "Muzikinis teatras - Muzykalny teatr - Musiktheater - Musical Theatre"